Emi Buendia is leading Norwich's City's promotion charge but this time last year he was battling against relegation to Spain's third tier. As he prepares to face QPR, live on Sky Sports on Saturday, Nick Wright finds out how a season at Cultural Leonesa helped to shape him. Emi Buendia is putting together quite the highlight reel at Norwich City this season. There was the volley against Brentford labelled a "masterpiece" by Daniel Farke. There was the unstoppable drive - struck with his weaker foot - which almost burst the net against Swansea. Most recently, there was the ingenious overhead flick in the build-up to his second goal against Hull. The little Argentine has lit up the Championship, his flair and penchant for the spectacular ensuring Norwich have not missed the departed James Maddison. There have been seven goals and nine assists so far. No Norwich player has created more chances or made more final-third passes. Buendia has been instrumental to Norwich's rise to the top of the table, in other words. As he leads their seemingly unstoppable charge towards the Premier League, the feeling in Norfolk is that he is already worth 10 times the £1.5m they paid Spanish side Getafe nine months ago. Buendia was an unknown in England at that point, but the ability now shining through on Norwich's right flank has always been there. It earned him a move from Cadetes de San Martin, his boyhood club in Argentina, to Real Madrid at 13, and it was from there that he joined Getafe, becoming their youngest La Liga player when he made his debut aged 18 in 2015. Buendia went on to make 40 first-team appearances for Getafe over the next two-and-a-half years, representing Spain's U19s before switching to Argentina at U20 level, but it was only last season, on loan at newly-promoted Spanish second division side Cultural Leonesa, that he was first given the platform to show his talent on a consistent basis. "We had just come from an historic achievement the year before, winning promotion for the first time in 43 years," Ruben de la Barrera, Leon's manager at the time, tells Sky Sports. "We wanted to continue along the same line in Segunda, but we needed a game-changing player. "We were after a young guy with lots of ability but also the hunger and desire to show it. Emi appealed to us because of his age and because of what we had already seen from him in his career. We had one of the most limited budgets in the league, so when the opportunity came up to sign him on loan, we didn't have to think twice." Buendia would finish the season with seven goals and 11 assists in 42 appearances, picking up Leon's player of the year award, but it was a steep learning curve. Leon spent most of the season battling against relegation, eventually succumbing to the drop on the final day. For a young player like Buendia, the circumstances were not easy. "We pinned a lot of hope on Emi, but he wasn't a boy with much experience in the division," says De la Barrera. "I believe his season had a bit of everything. There were clear moments when he was adapting. There were moments in which he was brilliant. And there were months when his performances stabilised and he was consistent. "Overall, though, it was a really, really positive year for him." That's because, most importantly, it helped Buendia to grow up. He was 20 when he joined Leon, and while he was an exciting prospect, he was yet to experience the pressures and demands of a regular starting spot at first-team level. He has admitted himself he was immature. "Coming to Leon was something we knew would help him on a personal level - as well as us," says De la Barrera. "The circumstances required him to take a big step forward and to be determined. He became a vital player for us because of that game-changing ability in the final third, because he gave us things no one else could, but that also meant taking on responsibility." Pablo Hernandez tops the Power Rankings this week but Emi Buendia is not far behind. In January, Buendia recorded a video of fellow loanee Yelko Pino denigrating Leon and inexplicably posted it on social media. Pino's loan was terminated but Buendia was given a reprieve, returning to the side with a starring display in a 2-1 win over Sevilla Atletico. A week later, however, he was accused of spitting at an opponent during a heated derby against Real Valladolid. Buendia escaped censure over that incident, but it was another reminder he still had much to learn. He was fortunate that in De la Barrera, who is currently coaching Qatari side Al Ahli and working with the Qatar national team, he had a big supporter. "You have to remember that he was a young boy," he says. "He used everything happened to grow both personally and professionally. I really believe that it all did him good. The year in Leon gave him stability and it taught him about responsibility. It pushed him towards the level of maturity he needed to reach." The birth of his first child helped him off the pitch, and on it, there was responsibility not just to create and score goals but to help the team defensively. Buendia had little appetite for that side of the game at the start of the campaign, but Leon's predicament demanded a change of attitude. The fruits of his improvement can now be seen at Norwich. Farke has repeatedly praised Buendia's work-rate this season and his defensive efforts are borne out by the numbers. According to Opta, he has made 83 tackles in total - 25 more than any of his team-mates. Buendia has learned how to keep his cool at key moments, too. He is Norwich's most fouled player, with opponents frequently adopting rough tactics to throw him off his game, but he has shown impressive maturity - not least during the 3-0 win over local rivals Ipswich in February, when he was kicked repeatedly by blue-shirted defenders. "They wanted to annoy Emi because he is a key player for us, but he was disciplined in this situation and didn't react," said Farke. "For such a young player who is full of emotions, from South America, that is outstanding. We spoke about the game, what will come, but he was prepared. He reacted in a brilliant way and I'm pleased with this behaviour." His progress is no surprise to De la Barrera, who recalls Buendia being watched by a host of scouts and technical directors towards the end of his time at Leon. Leeds and Swansea were said to be among his suitors, but the decision to join Norwich, whose promotion push has been underpinned by shrewd transfer business, has been vindicated emphatically. 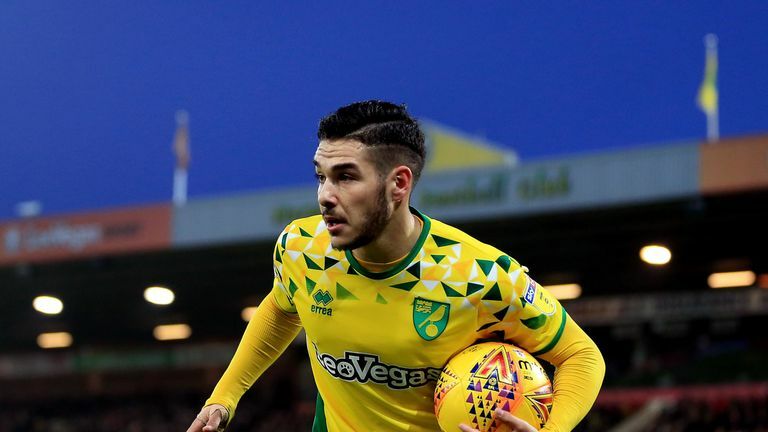 "The progress he has made this year doesn't surprise me because, from my point of view, I think the move to Norwich was exactly what Emi needed after his time at Leon," says De la Barrera. "He needed to put himself in another demanding situation, in a dressing room full of men and with less protection around him. I think the year at Leon, for what he experienced at a personal level as much as at a sporting level, gave him the motivation to take the next step, to leave his comfort zone and experience a totally different situation." Only seven games stand between Norwich and the Premier League. There are sure to be more twists and turns in the weeks ahead, but for Buendia there is little doubt a future at the highest level awaits. "If you ask me whether I can see Emi playing in the Premier League in the short-term, then my answer is absolutely yes," says De la Barrera. "It's only a matter of time until he takes that step into football of the highest level. That could be in the Premier League with Norwich, or in any other top league in Europe." For now, though, his sole priority is to help Norwich secure a seventh consecutive Championship victory when they face QPR on Saturday. It would be no great surprise to see another addition to the Emi Buendia highlight reel at Carrow Road.